I've been away for a few weeks helping with some family issues in Michigan, but now I'm back! This is a piece I worked on over the summer and just framed today. I call it "Bird Man". 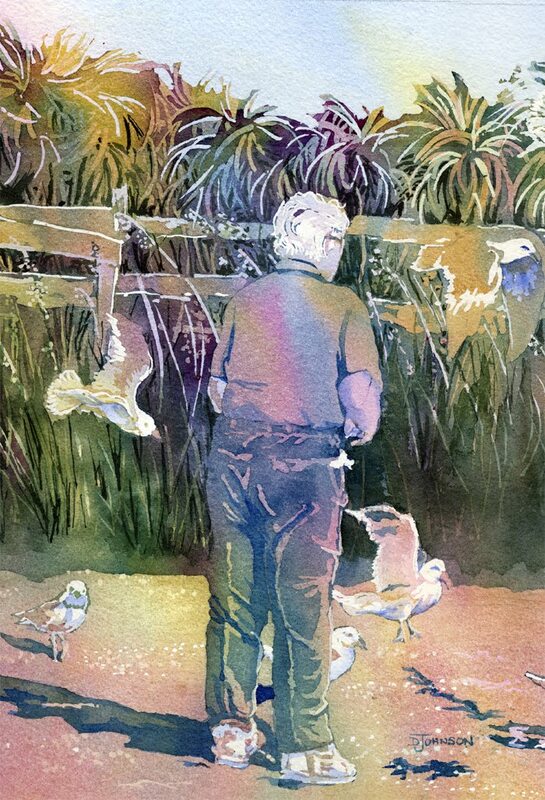 This was a man I saw last summer feeding the birds on the beach at Indialantic, Florida. When he walked onto the boardwalk the birds immediately started to gather, so I am assuming he was a regular there. I could see his delight and patience with the birds and each bird had a personality of its own, some cranky and rushed, some slow and patient. The colors in this piece were fun and I did a little direct painting into the darkest areas and on the birds at the end of this work.